Life is short, so I try to make the most of it. 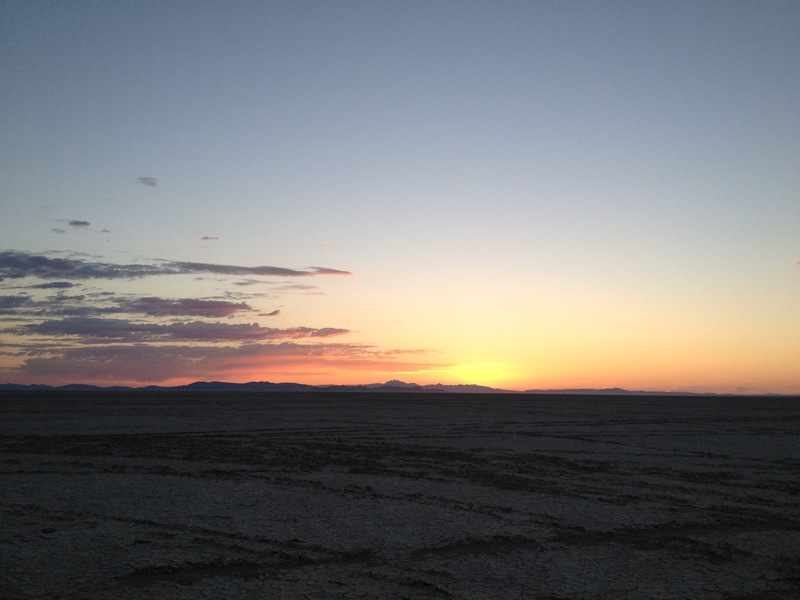 Try new things, venture to new places, and go boldly where no sane person with Fibro would ever go– the Black Rock Desert. Call me crazy, but I really just wanted to see if my body could handle it. So, I packed up my things. Crossed a few fingers. Hoped for the best, and ventured out to the desert with my boyfriend. Here’s what I learned in my 72 hours of desert sanctuary– DON’T DO IT! Nah, just kidding. Stick to a routine. We all have our normal routines at home. Try not to change it. This will help your body adjust to the weather conditions. Take your meds as planned, even if your routine is a little off. I woke up with the sun (at 5-f-ing am)– 3+ hours earlier than normal. I tried to take my meds at 8:00 am, just like I do at home. Stay covered. It seems simple, but staying in covered from the direct sun helps. I wore a SPF 30 rated long sleeve shirt to protect myself. The last thing I wanted to deal with was a sunburn. Stay hydrated. Again, it seems simple. We all have meds which can cause us dry mouth. It’s hard to take care of cotton-mouth and stay fully hydrated. Try a variety of drinks- cold and “room” temperature. Also, try to avoid taking any meds that just add to dehydration– for example most opiates cause dry mouth. Try new therapies. When my body aches, a heating pad or a hot bath always helps. Yeah, like that was going to happen in the desert. Hot therapy does not work when it’s already f-in’ hot outside. I found that cold helped and sleep. Take every chance to keep your body cool. I froze drinks and took trips to the lake to enjoy a lil’ fresh water. Though, what I really wanted was a cold ice pack for my neck. Maybe, next time I’ll remember to bring one. Stay away from alcohol. Yeah, learn from my mistakes. I had some scotch with the boys, and I regretted it the next day. Keep on your diet. It’s hard to stay on your diet when you are in the desert with limited supplies to a produce market. However, if you pack well, it’s easy to plan ahead. FInd a quiet place. This seems silly when there was desert as far as the eye can see; however, having some alone time helped me center. At one point, my hypersensitivity kicked in,and everything bugged me. All I needed to do to gain control again was step away from the party.